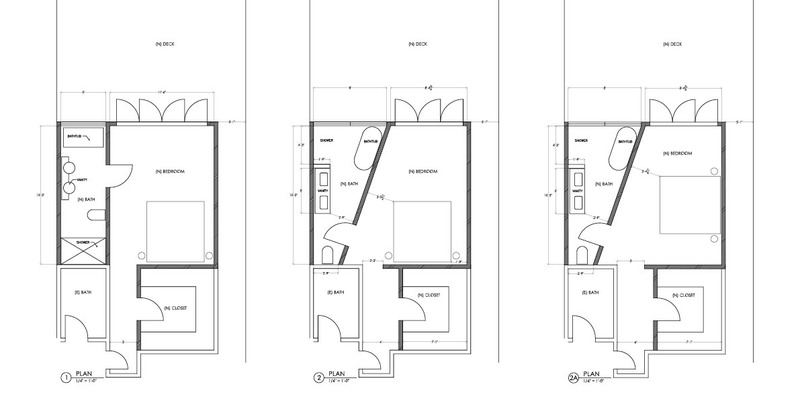 When enlarging a bedroom, creating a bath suite, or finding room for a walk-in closet, call your architect on demand! 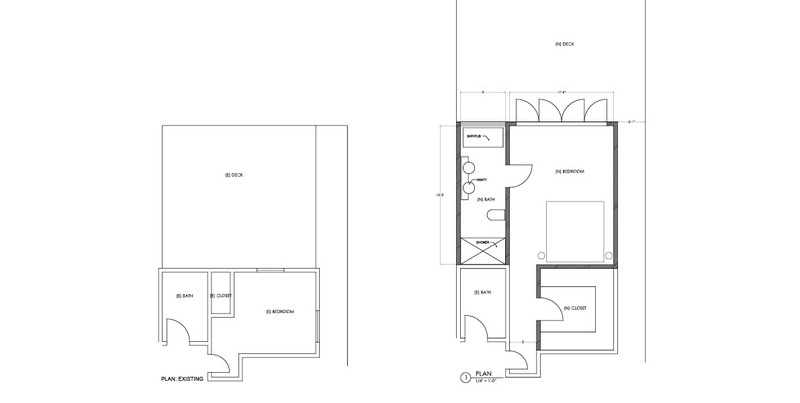 A rough layout/dimensions of current bedroom and bath. He clearly indicated adjacent rooms that would remain and adjacent deck that would supply the additional square footage for the extension. Adding 250 sf to a small bedroom changes everything. Thus, the “enlarging” involves demolition and extension to create a spacious bedroom and bath suite with a walk-in closet. It’s clear; I can estimate the time it would take to draw up the existing to scale and then to come up with a couple of workable ideas. Sure! I refer him to the blog. Next thing I know, he’s ordered my how-toBook DIY Like an Architect. I start immediately and send in version one. Apparently, I’ve overlooked the inspiration photo. He attaches it again. Now, that I am quite familiar with the project it’s obvious. More than anything, he loves how the tub and the shower are combined. It was my mistake to assume that he was simply focusing on decorative finishes and the view from the window. Great feedback. His input helps me refine the layout. Versions 2 & 2A feature a master bathroom that not only incorporates the view — it combines the shower and bathtub. In the end, enlarging a small bedroom and adding a bath suite (at least on paper) turns out to be not such a daunting endeavor! This is a super breakdown oh how DIY Ally, Architect on Demand works. How awesome that working with such a talented, renowned architect is so accessible through your site! You make people’s dreams come true! How great is that!? Thank you so much, Mia!! !